1. Beat the butter, honey and tahini in a food processor or bowl until combined and smooth. Set aside. 2. Mix the flour and salt in a large bowl and make a well in the middle. Whisk the milk, egg and sesame oil together in a medium jug until smooth. Slowly whisk the wet ingredients into the flour until there are no lumps. Set aside. Peel the bananas and cut into rounds. 3. Warm a dry, non-stick frying pan over a medium heat. Add the sesame seeds and toast for 1-2 minutes, tossing occasionally, until golden. Remove to a plate. Return the pan to the heat. Add a little sesame oil to warm up. Cooking in batches, drop tablespoons of batter into the frying pan (approx 8cm in diameter) and dot with some banana slices. Once the mixture is starting to set and bubble, flip the pancakes over and cook for a further 1-2 minutes, until golden and cooked through. Keep warm. Repeat to make 16 pancakes. 4. 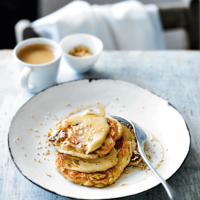 Stack the cooked pancakes onto plates, spreading a little of the sesame honey butter in between each one. Drizzle generously with honey and sprinkle with the toasted sesame seeds before serving. The sesame butter will keep covered in the fridge for as long as the use by date on the butter pack is valid. It is delicious on hot toast, as a change from peanut or almond butter.